SKA IN VIENNA WOODS is based on a waltz by Johann Strauss. 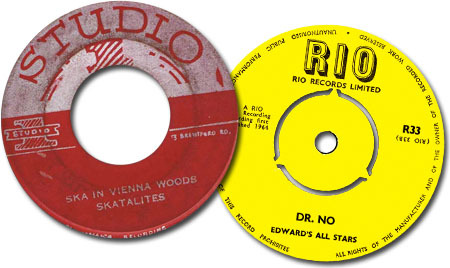 recorded in Jamaica by the Baba Brooks Band (King Edward´s All Stars) as DR. NO. Alice Faye "You'll Never Know"
Gene Autry "South Of The Border"
Obernkirchner Kinderchor "Mein Vater war ein Wandersmann"
Josephine Baker "Don't Touch Me Tomatoes"
George Symonette "Don't Touch Me Tomato"
Roy Orbison "She Wears My Ring"
Glen Miller / Dorothy Claire "Perfidia"
uses the melody from "Máh-Ná-Mah-Ná"
"Drink To Me Only With Thine Eyes"
Pete Seeger "Turn Turn Turn"